A perfect replica of the 1966 Batmobile — one previously owned by the original designer, George Barris — is now for sale. 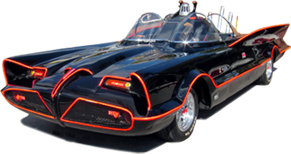 Pennsylvania dealership LBI Limited has announced the sale of the vehicle made famous by the “Batman” television show staring Adam West as the caped crusader and Burt Ward as Robin. The series aired from 1966 through 1969. “Batman: The Movie” was also released in 1966. “Replica #5” was built on a 1958 Thunderbird chassis by engineer Jim Sermersheim in 1966 and owned by Mr. Barris within the year. The vehicle was used in promotional events across the country, but it is not known if it was filmed during the show’s production. Road and Track magazine reported Monday that LBI’s sale price of $500,000 is a “relative bargain” since the Barris-designed original sold for $4.2 million.